France didn't apply RDR Article 44 (first establishment of agroforestry on agricultural land) when the RDR was first introduced, but is now intending to do so. Its Rural Development Plan (Objectif Terres 2020) includes agroforestry as one Measure out of 60 to be applied, and it is particularly justified for reasons of biodiversity, improved agronomy, landscape enhancement and soil protection. Unusually for an EU Member State, the French Rural Development Plan runs to 2020 rather than the end of the RDR period in 2013, and provides continuity and assurance for Farmers. Objectif Terres 2020 has 5 goals: 1) Water use; 2) Water quality; 3) Biodiversity and landscape; 4) Soil protection; 5) Energy and climatic changes Agroforestry can contribute to all these goals (although in the document it is mentioned in relation to goals 3 and 4). Agroforestry is defined as “an association, on the same plot of land, of crops (or pasture) and trees“. It is noted that the technique “utilises synergies between crops and trees and can reduce inputs and enhance biodiversity“. It is also noted that its increased use requires “clarification of its legal (particularly the ‘Statut du Fermage’) and tax status“, and that uptake “depends on dissemination of technical results, particularly through farmers networks“. Page 36 quotes the example of the Community of Hérault Méditerranée which has developed agroforestry systems in conjection with INRA. Farmers have introduced lines of trees at spacings between 15 and 50 meters, between crops or pasture. This has enhanced biodiversity and slowed soil-erosion and runoff. The benefits are not only environmental however, since agroforestry allows producers to diversify their income sources and consolidate their farming activities. Based on these encouraging early results INRA, in partnership with the Chamber of Agriculture of Hérault, has agreed to finance 50% of the cost of six new agroforestry projects developed by the municipalities of Agde, Bessan, San Thibéry and Pezenas, extending to 27 hectares. This successful introduction of agroforestry into the new French Rural Development Policy reflects the efforts of INRA, the French Chambers of Agriculture, NGOs like AGROOF, the EU Funded SAFE Project and the French Agroforestry Association. 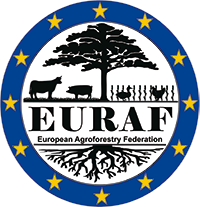 France is clearly ahead of other European Countries in the implementation of new agroforestry schemes.